Like forms in the natural world, musical forms have their own, distinct identities. A ballad is one thing, a sonata another. In his review of the Cowley Carol Book (1902), a collection of traditional Christmas carols, the British musicologist Sir William Henry Hadow (1859-1937) explores the differences between two such forms: the carol and the hymn. Although Sir Henry’s discussion has nothing overtly to do with Zen, it brings to mind an important component of Zen practice. Zen has no exact equivalent of the hymn or carol. Western “bare-bones” Zen, as practiced by Toni Packer, Joan Tollifson, and others, dispenses with liturgy altogether; and even the liturgy of formal Zen, with its wood-blocks, bows, and bells, is a plain austere affair, at least when contrasted with Sunday morning at York Minster or Evensong at King’s College, Cambridge. Yet formal Zen does make use of chants, which combine the most prominent features of hymns and carols. Like the hymn, such chants as Atta Dipa (“You are the Light”), the Heart Sutra, and the Four Great Vows embody the authority of a venerable tradition. Chanted in Pali or Sino-Japanese, they evoke a strangeness comparable to that of an Anglican Mass. At the same time, most Zen chants are, in musical terms, rudimentary. The Heart Sutra is chanted in a rhythmic monotone, and Atta Dipa consists of two notes at an interval of a fourth (do-fa). However strange their idiom or formidable their authority, they can be learned and chanted by anyone. Nowhere are these purposes more evident than in Tei Dai Denpo, or lineage chanting, in which Zen practitioners intone the names of their ancestral teachers. Shido Bunan Zenji. 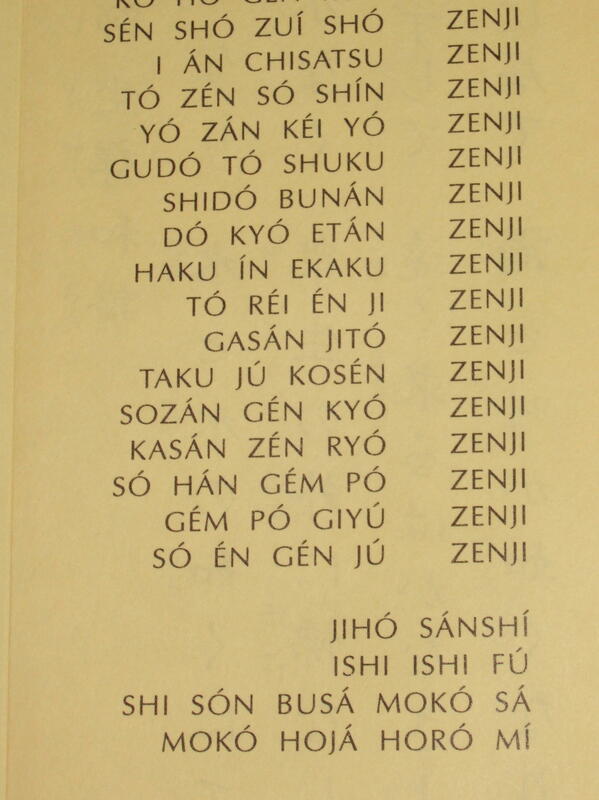 Dokyo Etan Zenji. Hakuin Ekaku Zenji. . . Echoing in the zendo, this ancient chant evokes a mood of profound communal gratitude. Traversing the centuries, it conjures an unbroken lineage of practice, thought, and feeling, extending from the fifth century B.C. E. to the present day. An amalgam, if you like, of hymn and carol, it also honors the teachers in ourselves. *Sir Henry Hadow, “Carol Singing,” Times Literary Supplement, January 2, 1903. *John Daido Loori Roshi, Bringing the Sacred to Life : The Daily Practice of Zen Ritual (Shambhala, 2008), 65-66.